Star of life tattoos are often a popular type of tattoo among workers in the healthcare industry. The symbolism of the tattoo and the hope it signifies draws many to the design. The Star of Life is a six point star (very similar to an asterisk) with a snake wrapped around a staff (also known as the Rod of Asclepius) in the middle of the star. The outline of the star is usually white and the inside of the tattoo is blue with the snake on a pole in white. Originally, the star was used to identify emergency services personnel but has now become a much larger symbol of emergency care. The Rod of Asclepius is often used in healthcare. The symbol itself is a Greek symbol for healing and assistance. Although snakes have other meanings stemming from Biblical times, in this case, the snake on the staff is meant to be a sign of rejuvenation because snakes shed their skin in order to be renewed. For people thinking about getting Star of Life tattoos, there are numerous choices that can be made. The tattoo can be looked at as a symbol for many different aspects of health care, and it can be placed numerous places on the body and combined with other elements for a powerful tattoo statement. The Star of Life is primarily symbolic of those the people who dedicate their lives to helping others. If you are in emergency services, the Star of Life makes a great tattoo to show pride in what you do. 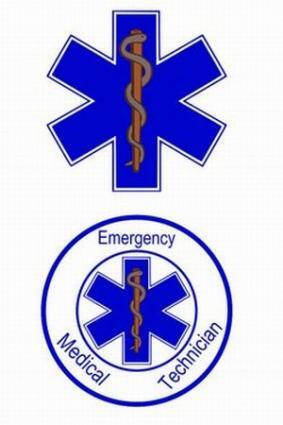 Even if you are not an EMT, the Star of Life would make a symbolic tattoo to honor those in healthcare. It can also be a great symbol for those who value their health and want to honor their dedication to that with a tattoo. Other symbolic meanings for the tattoo include rejuvenation after a horrible event (such as drug withdrawal), resurrection and faith against illness (such as cancer). Although the Star of Life is chock full of symbolism, the placement of the tattoo is dependent on which exact design and size you ultimately choose. The Star of Life is littered with symbolism and, as a result, does not lend itself well to different designs. The design of the star is rather straightforward. However, that doesn't mean you shouldn't let your imagination run wild. While the Star of Life is blue, you could use another color in the design if you want something different. The Star of Life would work well on a colored background. Consider an ocean scene with the star in the forefront of a brightly colored oceanscape. Since the Rod of Asclepius brings thoughts of the Bible to many, a Biblical scene featuring other Bible characters would be a nice fit for those with strong religious convictions. The Star of Life design works well with an accompanying banner. Consider using the banner to honor someone who has helped you save your health. If you are interested in getting an armband piece, the Star of Life would look great with Celtic designs completing the bracelet. The Star of Life is ultimately meant to identify emergency service professionals so that people who need them can easily identify them. Keep the symbolism of the design in mind if you consider using it for a tattoo.